Graduate students Laura Brattain, Caspar Floryan, and Oliver Hauser designed a device that reduces the risk of missing a target during an ultrasound-guided needle biopsy. Image courtesy of Conor Walsh. Sometimes you have to walk around in another person's lab coat to really understand a problem. In ES 227, "Medical Device Design," a new course at the Harvard School of Engineering and Applied Sciences (SEAS), engineering students are given the opportunity to solve a practical problem in a hospital setting, trying out the tools, learning about their use in real-world situations, and, in some cases, even sitting in on a surgical procedure. Taught by Conor Walsh (pictured), a newly appointed Assistant Professor of Mechanical and Biomedical Engineering at SEAS, with help from teaching fellow Sam Kesner, the course connects the dots between engineering and medicine at Harvard. That firsthand experience has paid off, as the undergraduate and graduate students who took the course in the spring are now parlaying their sophisticated designs into patents and publications. Brandon Hopkins ’11, William Marks ’12, and graduate students Qimin Quan and Huayin (Helen) Wu wanted to find way of preventing “steal syndrome” in patients who were undergoing kidney dialysis. To facilitate dialysis, a special tube called a graft is typically implanted in the patient’s arm, allowing blood to be siphoned out of the body and then returned. In about 8 percent of cases, the graft “steals” too much blood, and circulation bypasses the hand, potentially resulting in tissue damage. These students were able to watch Dr. Keith Ozaki, a surgeon at Brigham and Women’s Hospital, perform a graft implantation procedure on a real patient. “It gave us a much better understanding of the setting, as well as details like the incision size,” says Wu. The open-ended nature of the class was made possible with a grant from the Center for Integration of Medicine & Innovative Technology (CIMIT), a Boston-based consortium of universities and teaching hospitals that supports translational research in clinical health care. With the aims of CIMIT in mind, Walsh and Kesner acted as R&D project managers for the engineering students, mimicking the design process at professional engineering firms. Before the students jumped on any ideas, they were required to read the medical literature, meet with the doctors (who were treated as clients), and analyze the existing tools’ strengths and weaknesses. "Early on in the process, it's important for students to operate at a conceptual level and stick to back-of-the-envelope calculations," says Walsh. "By the end of the course, they'll have analytical models programmed in MATLAB or Excel and have detailed Solid Works models of al lof their components, ready to be sent out to a machine shop." A final design for a device that reduces the risk of missing a target during an ultrasound-guided needle biopsy. ES 227 gives students the opportunity to apply the computer-aided design skills they have learned in courses like ES 51 to a real-world problem. Image courtesy of Conor Walsh. The in-between part, of course, is where the real learning takes place; the faculty and staff say their role is to help students blend creativity with a deterministic design process. The students must learn to analyze,evaluate, critique—and communicate—their own ideas before moving forward. “At the start of the process, we never want a student team to come and say, ‘This is what we want to do. It’s the best way,’” says Walsh. "In design, if you can be your own best antagonist and come up with many competing concepts yourself, I think that's really helpful, because you'll end up learning something from the first idea that eventually leads you to a better solution." Loschak and classmates Kechao Xiao and Hao Pei chose to design a portable, hand-held drill that can safely create a hole in the skull without damaging the soft tissue inside. Cranial drills can be important for measuring and relieving pressure on the brain immediately after a severe head injury. For any device, but especially for one intended to work so close to the brain, certain design parameters (e.g. how quickly the drill must stop) are non-negotiable, and some of the team’s initial ideas did not work. However, they eventually came up with an ingenious mechanism in which, the moment the drill penetrates the cranial cavity, the change in physical forces makes the drill bit automatically retract. In fact, all the doctors involved were as excited and dedicated as the students, faculty, and staff at SEAS, devoting both nights and weekends to review designs and prototypes. The semester’s efforts really began with the physicians, eight of whom initially volunteered their time and ideas for four possible projects. Anas Chalah, Director of Instructional Laboratories and the Safety Program at SEAS, arranged for the course to have a large, exclusive lab space adjacent to the rapid prototyping shop in Pierce Hall, where students had easy access to 3Dprinting and milling equipment. The support of Chalah's staff and facilities allowed students to rapidly iterate through various design concepts and provide the clinical team members with physical prototypes to manipulate and discuss. And for the students, the course was just the first phase of an ongoing idea translation process. 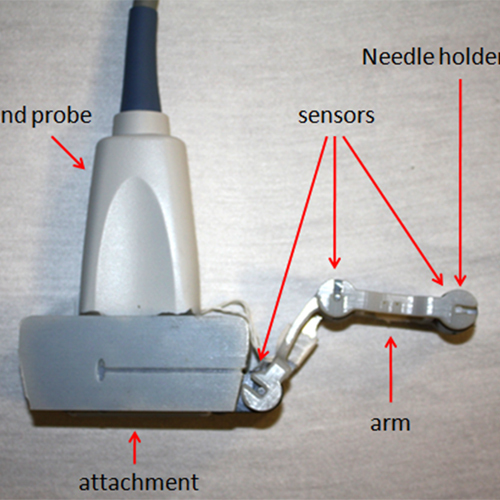 Graduate students Laura Brattain, Caspar Floryan, and Oliver Hauser earned a publication about their device, which reduces the risk of missing a target during an ultrasound-guided needle biopsy. They have already presented their work at the Wyss Institute and at the annual conference of the IEEE Engineering in Medicine and Biology Society (EMBC ’11). Two other groups of students, who designed the dialysis graft resistance adjustment mechanism and a glove that exercises a patient’s finger joints after an injury, are in the process of submitting their work for publication. Loschak and his teammates have been similarly successful: through Harvard’s Office of Technology Development, they have applied for a provisional patent on their cranial drill. ES 227 is a graduate-level course, though undergraduates who have taken ES 51 and have some design experience may also enroll. Walsh will teach the course again in Spring 2012 (he officially takes up his new post on January 1). "The level of interest [in ES 227] was high, the outcome was wonderful, and the fact of the matter is that the students learned a lot," says Chalah. “I think we’re going to witness an explosion in the number of students who want to take it next spring."